New at GSP: valet parking! Traveling can be hectic as you rush to make your flight on time. One goal GSP and the WINGSPAN project strive to achieve is to make traveling easier for you. Now we offer valet parking! With valet parking, travelers can arrive at the airport with ease knowing that they have a guaranteed parking spot that will not take up any extra time to find. Another perk is valet parking is curbside so you will have a short walk to the terminal. 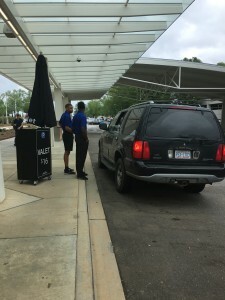 Valet parking operates near the daily parking entrance, and costs $16 a day. We are excited for these new features and feel that it’ll enhance the experience of our travelers!